I’m not ggplot2’s creator, Hadley Wickham, but I do find myself in discussions trying to explain how to build graphs in ggplot2. It’s a very elegant system, but also very different from other graphing systems. Once you understand the organizing philosophy, ggplot2 becomes very easy to work with. There is a basic grammar to all graphics production. In R‘s base graphics or in Excel, you feed ranges of data to a plot as x and y elements, then manipulate colors, scale dimensions and other parts of the graph as graphical elements or options. ggplot2’s grammar makes a clear distinction between your data and what gets displayed on the screen or page. You feed ggplot2 your data, then apply a series of mappings and transformations to create a visual representation of that data. Even with base graphics or Excel we never really plot the data itself, we only create a representation; ggplot2 makes this distinction explicit. In addition, ggplot2’s structure makes it very easy to tweak a graph to look the way you want by adding mappings. 2. Geometries geom_ The geometric shapes that will represent the data. 3. Aethetics aes() Aesthetics of the geometric and statistical objects, such as color, size, shape and position. A real example shows off how this all fits together. Demonstration of the key concepts in the grammar of graphics: data, geometries, aesthetic mappings and scale mappings. Here you can see that the data is passed to ggplot(), aesthetic mappings between the data and the plot coordinates, a geometry to represent the data and a couple of scales to map between the data range and the plot ranges. 5. Statistical transformations stat_ Statistical summaries of the data that can be plotted, such as quantiles, fitted curves (loess, linear models, etc. ), sums and so o. 6. Coordinate systems coord_ The transformation used for mapping data coordinates into the plane of the data rectangle. 7. Facets facet_ The arrangement of the data into a grid of plots (also known as latticing, trellising or creating small multiples). 8. Visual Themes theme The overall visual defaults of a plot: background, grids, axe, default typeface, sizes, colors, etc. Hadley Wickham describes various pieces of this grammar in recorded presentations on Vimeo and YouTube and the online documentation to ggplot2. The most complete explanation is in his book ggplot2: Elegant Graphics for Data Analysis (Use R!) (Wickham, 2009). Wickham, Hadley. 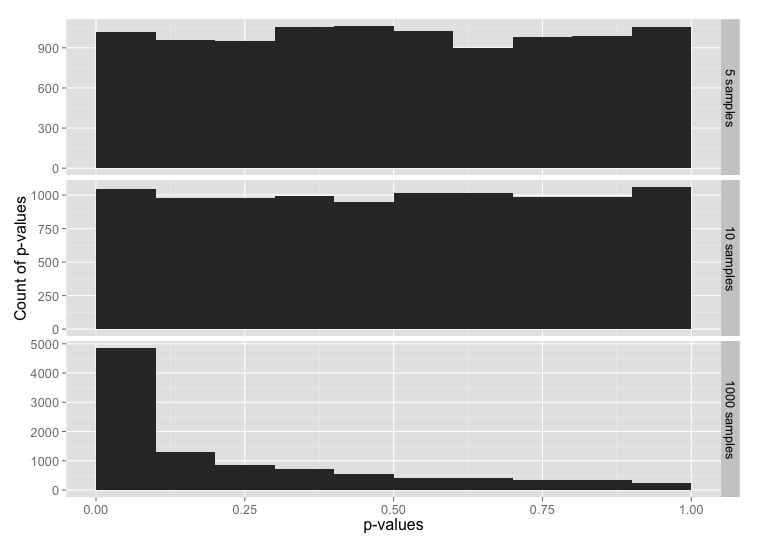 ggplot2: Elegant Graphics for Data Analysis. Dordrecht, Heibelberg, London, New York: Springer, 2009. Print. Wickham, Hadley. A Backstage Tour of ggplot2 with Hadley Wickham. 2012. Video. YouTube. Web. 21 Mar 2014. . Contributed by REvolutionAnalytics. Many of our statistical tests make assumptions about the distribution of the underlying population. Many of the most common—ImR (XmR) and XbarR control charts, ANOVA, t-tests—assume normal distributions in the underlying population (or normal distributions in the residuals, in the case of ANOVA), and we’re often told that we must carefully check the assumptions. At the same time, there’s a lot of conflicting advice about how to test for normality. There are the statistical tests for normality, such as Shapiro-Wilk or Anderson-Darling. There’s the “fat pencil” test, where we just eye-ball the distribution and use our best judgement. We could even use control charts, as they’re designed to detect deviations from the expected distribution. We are discouraged from using the “fat pencil” because it will result in a lot of variation from person to person. We’re often told not to rely too heavily on the statistical tests because they are not sensitive with small sample sizes and too sensitive to the tails. In industrial settings, our data is often messy, and the tails are likely to be the least reliable portion of our data. I’d like to explore what the above objections really look like. I’ll use R to generate some fake data based on the normal distribution and the t distribution, and compare the frequency of p-values obtained from the Shapiro-Wilk test for normality. #' @param data A vector of data to perform the t-test on. #' one column for each number of samples tested. #' and one column for the p-value. #' Make sure the levels are sorted correctly. I want to simulate real-word conditions, where we have an underlying population from which we sample a limited number of times. To start, I’ll generate 100000 values from a normal distribution. To keep runtimes low I’ll have assign_vector() sample from that distribution when performing the test for normality. 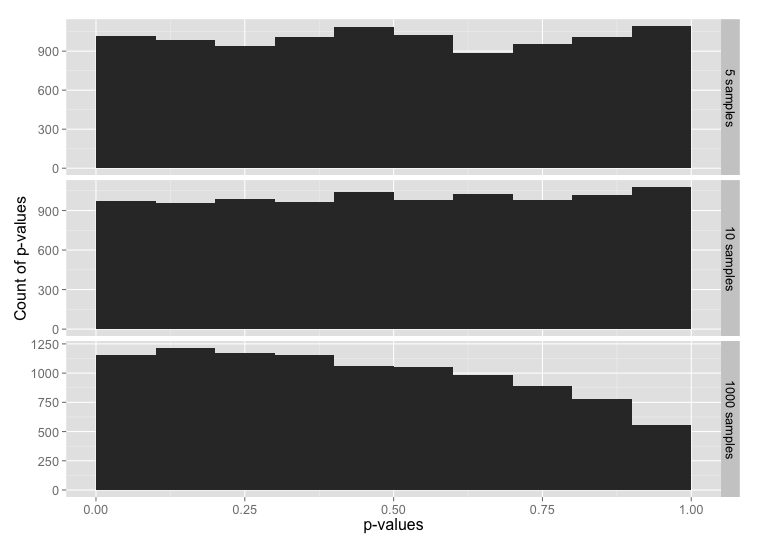 Histogram of p-values for the normal distribution, for sample sizes 5, 10 and 1000. This is, indeed, what we expected. 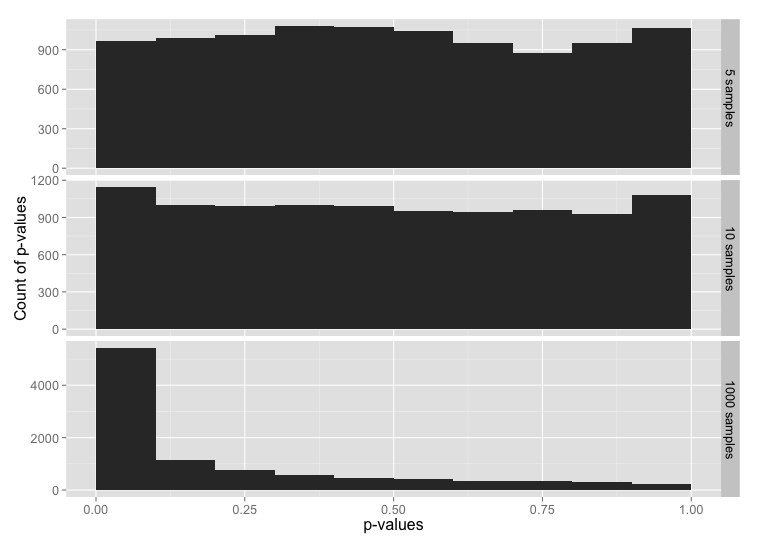 Histogram of p-values for the t distribution, for sample sizes 5, 10 and 1000. The tests for normality are not very sensitive for small sample sizes, and are much more sensitive for large sample sizes. Even with a sample size of 1000, the data from a t distribution only fails the test for normality about 50% of the time (add up the frequencies for p-value > 0.05 to see this). Since the t distribution is narrower in the middle range and has longer tails than the normal distribution, the normality test might be failing because the entire distribution doesn’t look quite normal; we haven’t learned anything specifically about the tails. To test the tails, we can construct a data set that uses the t distribution for the middle 99% of the data, and the normal distribution for the tails. 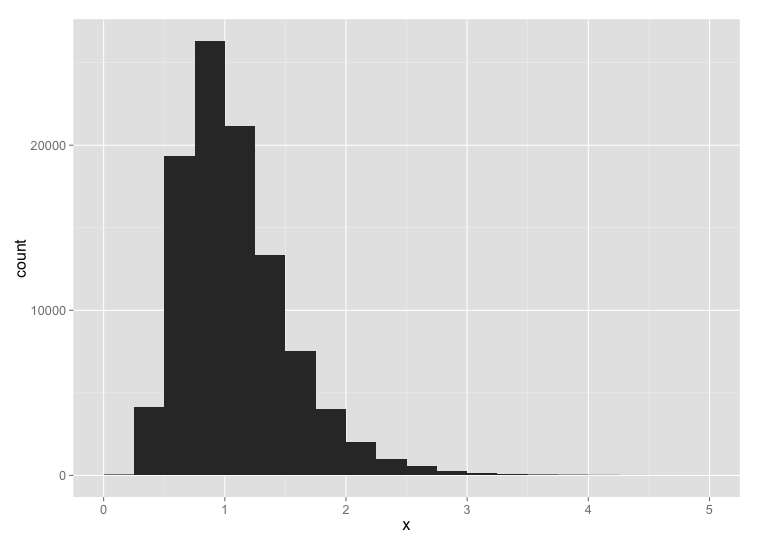 Histogram of p-values for sample sizes 5, 10 and 1000, from a data set constructed from the t distribution in the range -3 to +3 sigmas, with tails from the normal distribution below -3 and above +3. Now let’s flip this around: data that is 99% normally-distributed, but using the t distribution in the extreme tails. 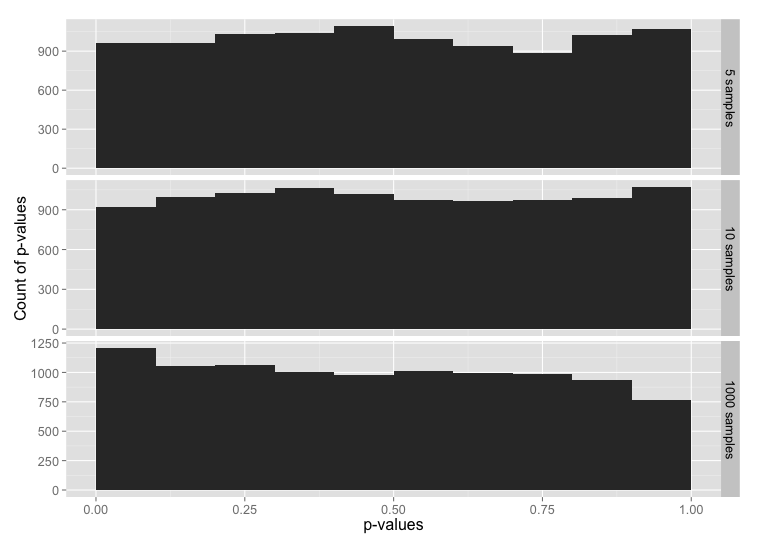 Histogram of p-values for sample sizes 5, 10 and 1000, from a data set constructed from the normal distribution in the range -3 to +3 sigmas, with tails from the t-distribution below -3 and above +3. Here, 99% of the data is from the normal distribution, yet the normality test looks almost the same as the normality test for just the t-distribution. If you check the y-axis scales carefully, you’ll see that the chance of getting p-value ≤ 0.05 is a bit lower here than for the t distribution. With small sample sizes, everything looks normal. The normality tests are, indeed, very sensitive to what goes on in the extreme tails. In other words, if we have enough data to fail a normality test, we always will because our real-world data won’t be clean enough. If we don’t have enough data to reliably fail a normality test, then there’s no point in performing the test, and we have to rely on the fat pencil test or our own understanding of the underlying processes. Don’t get too hung up on whether your data is normally distributed or not. When evaluating and summarizing data, rely mainly on your brain and use the statistics only to catch really big errors in judgement. When attempting to make predictions about future performance, e.g. calculating Cpk or simulating a process, recognize the opportunities for errors in judgment and explicitly state you assumptions. 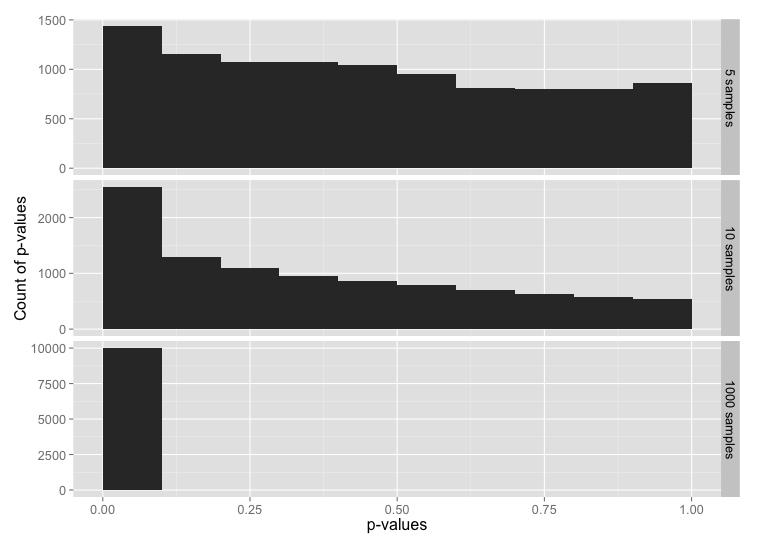 The free and open-source R statistics package is a great tool for data analysis. The free add-on package qcc provides a wide array of statistical process control charts and other quality tools, which can be used for monitoring and controlling industrial processes, business processes or data collection processes. It’s a great package and highly customizable, but the one feature I wanted was the ability to manipulate the control charts within the grid graphics system, and that turned out to be not so easy. I went all-in and completely rewrote qcc’s plot.qcc() function to use Hadley Wickham’s ggplot2 package, which itself is built on top of grid graphics. I have tested the new code against all the examples provided on the qcc help page, and the new ggplot2 version works for all the plots, including X-bar and R, p- and u- and c-charts. This both generates the plot and creates a qcc object, assigning it to the variable x. You can generate another copy of the plot with plot(x). To use my new plot function, you will need to have the packages ggplot2, gtable, qcc and grid installed. Download my code from the qcc_ggplot project on Github, load qcc in R and then run source("qcc.plot.R"). The ggplot2-based version of the plotting function will be used whenever a qcc object is plotted. The qcc individuals chart as implemented in the qcc package. The qcc individuals chart as implemented using ggplot2 and grid graphics. The qcc moving range chart as implemented in the qcc package. The qcc moving range chart as implemented using ggplot2 and grid graphics. In addition to the standard features in qcc plots, I’ve added a few new options. 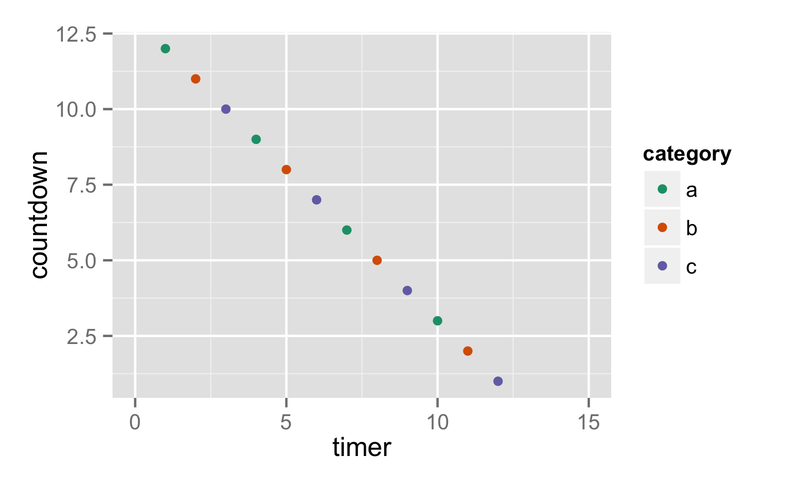 Set the size of the points used in the plot. This is passed directly to geom_point(). Sets the size of text elements. Passed directly to ggplot() and grid’s viewport(). Eliminate the main graph title completely, and expand the data region to fill the empty space. As with qcc, with the default title = NULL a title will be created, or a user-defined text string may be passed to title. If TRUE, creates a new graph (grid.newpage()). 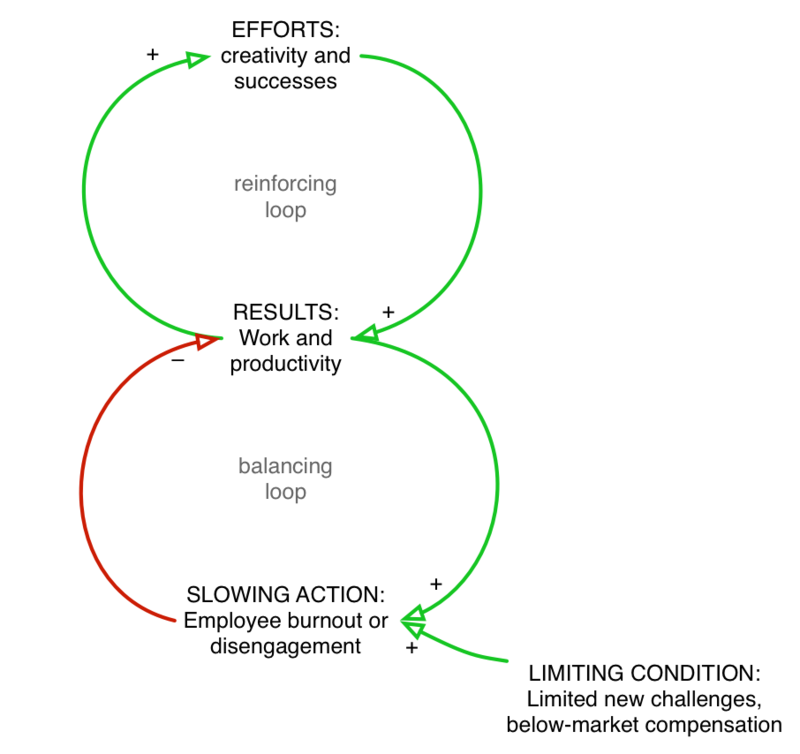 Otherwise, will write into the existing device and viewport. 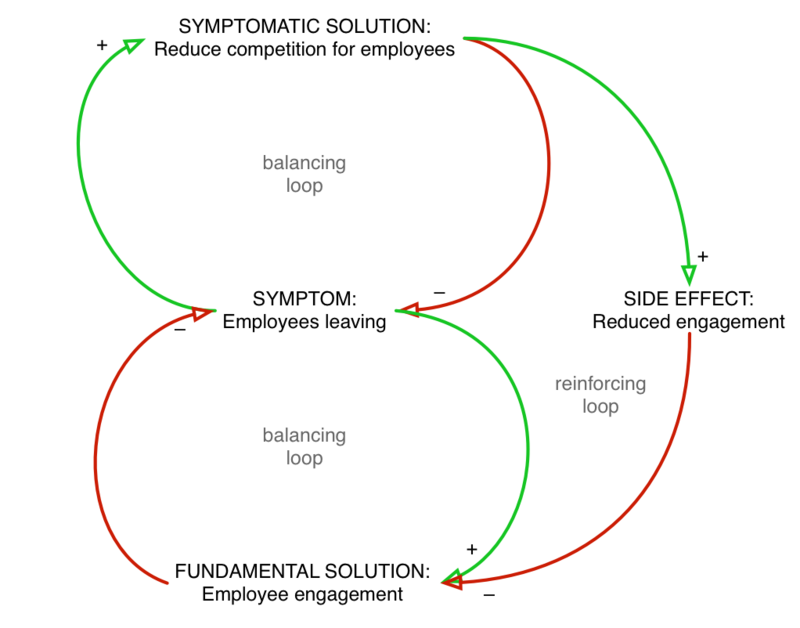 Intended to simplify the creation of multi-panel or composite charts. The argument digits is provided by the qcc package to control the number of digits printed on the graph, where it either uses the default option set for R or a user-supplied value. I have tried to add some intelligence to calculating a default value under the assumption that we can tell something about the measurement from the data supplied. You can see the results in the sample graphs above. This little project turned out to be somewhat more difficult than I had envisioned, and there are several lessons-learned, particularly in the use of ggplot2. Different variations of this sometimes worked, or sometimes only plotted some of the points that are supposed to be colored red. Another nice lesson was that aes() doesn’t always work properly when ggplot2 is called from within a function. In this case, aes_string() usually works. There’s less documentation than I would like on this, but you can search the ggplot2 Google Group or Stack Overflow for more information. One of the bigger surprises was discovering that aes() searches for data frames in the global environment. When ggplot() is used from within a function, though, any variables created within that function are not accessible in the global environment. The work-around is to tell ggplot which environment to search in, and a simple addition of environment = environment() within the ggplot() call seems to do the trick. This is captured in a stack overflow post and the ggplot2 issue log. Finally, it is possible to completely and seamlessly replace a function created in a package and loaded in that package’s namespace. When I set out, I wanted to end up with a complete replacement for qcc’s internal plot.qcc() function, but wasn’t quite sure this would be possible. Luckily, the below code, called after the function declaration, worked. One thing I found was that I needed to name my function the same as the one in the qcc package in order for the replacement to work in all cases. If I used a different name for my function, it would work when I called plot() with a qcc object, but qcc’s base graphics version would be used when calling qcc() with the parameter plot = TRUE. For now, the code suits my immediate needs, and I hope that you will find it useful. I have some ideas for additional features that I may implement in the future. There are some parts of the code that can and should be further cleaned up, and I’ll tweak the code as needed. I am certainly interested in any bug reports and in seeing any forks; good ideas are always welcome. Scrucca, L. (2004). qcc: an R package for quality control charting and statistical process control. R News 4/1, 11-17. Wheeler, Donald. “Individual Charts Done Right and Wrong.” Quality Digest. 2 Feb 20102 Feb 2010. Print. <http://www.spcpress.com/pdf/DJW206.pdf>. Individuals and moving range charts, abbreviated as ImR or XmR charts, are an important tool for keeping a wide range of business and industrial processes in the zone of economic production, where a process produces the maximum value at the minimum costs. While there are many commercial applications that will produce such charts, one of my favorites is the free and open-source software package R. The freely available add-on package qcc will do all the heavy-lifting. There is little documentation on how to create a moving range chart, but the code is actually quite simple, as shown below. The individuals chart requires a simple vector of data. The moving range chart needs a two-column matrix arranged so that qcc() can calculate the moving range from each row. #' that is used to calculate the moving range. The qcc moving range chart. The code is also available as a gist.